Whenever I photograph anything I always notice what needs to be fixed. The one drawer on the right has paper stuck behind it and wouldn’t close all the way (my hubby handyman has it on his to do list.) There is always something to work on in a home, isn’t there? My Santa theme is carried out here with a tree at one end. Another view of tree. It’s quite the jolly little tree. Makes me merry whenever I look at it. For the season, I put up this adorable hanging on my bulletin board. The sign is from an Etsy shop called KbeltDesigns it’s a line from the book, The Night Before Christmas. She has a wonderful shop, please go check her out. My planner cover is also from an Etsy shop called 13 Hour Creations. The little clips at top of planner, one in a Santa hat is from another Etsy shop called Peach Pom and the candy cane striped bow clip is from Lane and Alley Boutique, also wonderful shops I frequent. This shelf at the other end of my desk showcases my adorable village that my Mom-in-law gave me when we were first married. I just love miniature scenes. This one has the village on the bottom with church on the hill. The next level has the train station. The top level has a small farm. Here is a close up of the bottom level. The little nativity on the side reminds me of ones we were given in Sunday School when I was a child. Santa is picking up his letters. Across the room from this is are larger shelves that continue this Letters to Santa mini theme with in a theme. This corner also has two cups of pens with a jolly Santa candy jar that holds peppermints. Across from the desk is this cozy spot. A comfy chair with pillow fit for Santa to rest in while he reads his mail. Above are shelves that have a theme of Letters to Santa. 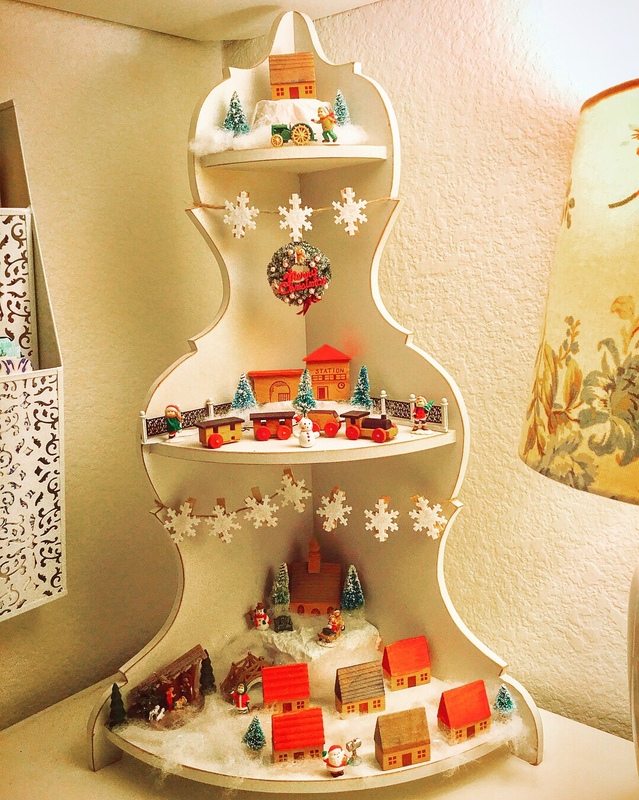 The bottom shelf has Mrs. Claus and Santa flanking an oversized letter. The words naughty and nice playfully sit here as we all wonder this time of year if we’ve made the right list. The 2nd shelf has a large gold envelope with the words: ho ho ho. Inside the envelope old Christmas cards merrily poke out while Santa and an angel look on. The top shelf has Santas flanking a large Christmas stamp …big enough to insure that the letter makes it all the way to the North Pole. Close up of Christmas envelope. I love the details of the address. Close ups of the gold envelope and the North Pole Postage. The opposite corner of this room is where my husband’s desk will be. He hasn’t moved in yet.